Tezpur one of the oldest inhabited town in the state of Assam was originally referred by the name Sonitpur.However now it is the Headquarters of Sonitpur District, in Assam. Along with its majestic blue hills, flourishing green valleys, lavishing tea gardens and the breathtaking snow covered peaks of The Mighty Himalayas, it is also the cultural capital of Assam. With ample potential in the field of nature, tea, climate and culture it became favourite amongst the British. 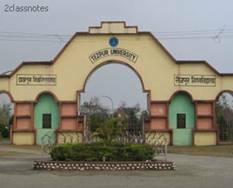 It is one of the most developed cities in Assam with its University and educational institutions. Tezpur means town of blood. The history behind this name is that when Tezpur was ruled by Bana Raja,his daughter Usha and Anirudha grandson of Lord Krishna, fell in love with each other. When this came to the Kings notice he sternly objected this and he isolated Usha in a place called Agnigarh.But when Anirudha tried taking away Usha there was a war between Lord Krishna and Bana raja leadind to a major bloodshed with loss of lot of lives. Study from the history also says that the vicinity of the town has historical ruins of the 8th-9th century like Bamuni Hills.The ruins of Da Parbatia is a shining example of the architecture around the 4th Century AD. 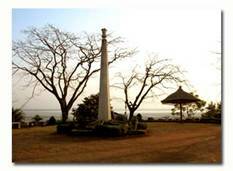 Modern Tezpur was founded by the British colonial administration in 1835 as the headquarters of Darrang district. Durga Puja is also a prominent festival celebrated in the month of October. This is celebrated with great devotion and enthusiasm for a period of nine days. The Ambubashi Mela at Kamakhya Temple in Guwahati is celebrate in the months of June-July is a popular festival which attracts pilgrims from all over the India. This is big fortress built on top of a hill to isolate Usha the daughter of Bana King from Anirudha, grandson of Lord Krishna.The fort was surrounded by fire on all times and thats how the place got its name Agnigarh meaning 'residence amidst fire'.Agnigarh is a big fortress constructed on top of a hill on the banks of Brahmaputra.The access to this place is quite interesting to reach the top of the hill one should take a circular staircase and is a good option for trekking. On your way to the top of the hillock, you will see lot of images relating to the legend behind the construction of the fort. The ruins of the Bamuni Hills are famous for their aesthetic beauty. The sculptural ruins, dating back to the 9th and 10th century A.D. now lie here for the tourists. 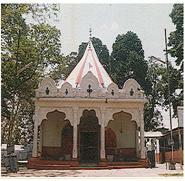 This temple houses the statue of Lord Shiva which is supposed to be the second largest in the world and was ardently worshipped by the Bana King.It is very sacred place to be visited in Tezpur.Cole Park has been the ideal location fro hosting many exhbitions in the town.It is also popularly referred by the name Chitralekha Udyan. 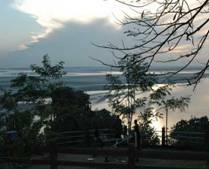 Cole Park is known for Bhomaraguri inscription which is the ancient plan for building a bridge across River Brahmaputra.The other attraction of this place is the boating in a small lake in front of the park. Da-Parbatia is one of the most famous Gupta era ruins near Tezpur with an exquisitely carved door leading to the inner temple. On either side of the door are carvings of the Goddesses Ganga and Yamuna, with garlands in their hands. The entire door frame is covered with elaborate carvings of flowers and foliage. 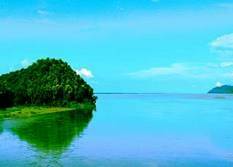 This a very huge lake covering an area of about 70 acres and archeology dates its excavation to the early part of the 19th century.It got its name from Harzara Varman of Tezpur. The presiding deity of this oldest temple of Assam is Goddess Durga.Bhairabi Temple is situated on Tezpur border.The stones of the temple is adorned by intricate carvings and images that date back to 9th century.The people visting this temple offer ghee lamps,fruits and sweets to the goddess.The temple still carries out sacrificial offerings of goats and bulls regularly. Ketakeshwar Dewal is dedicated to Lord Shiva and is said to have the second biggest Shivalingam in the world.This shrine is a very holy place to the Hindus and is regularly visited by the tourists.There are actually two parts to the temple, one where which is said to be the original place of the Shivalingam and another where the Shivalingam is located presently. This place is a famous spot around Tezpur for it has the third-largest orchidarium in Asia. A mammoth stone inscription made by the Ahom General Kalia Bhomora Phukan, who planned to construct a bridge over Brahmaputra could be seen here. About two centuries later, a bridge over Brahmaputra at the same place has now been constructed. The 3.05 km. Bridge named after the great Ahom general, connecting Nagaon district with Tezpur was opened for vehicular Traffic on 3rd April 1987. 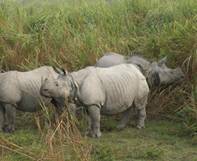 Kaziranga National Park, a World Hertage Site is about 45 kms away from Tezpur. One horned rhinoceros is the main attraction of the national park, besides, you can see other animals like tigers, birds, elephants, sambar, barking deer and a variety of avian species in the park. This Wildlife Sanctuary is located at a distance of about 65 km west of Tezpur.It is a small reserve of forest surrounded by nature and densely packed wood which is the home for rhinoceros,wild elephant and buffalo, leopard, sambar, barking deer, tiger, and a variety of water birds. Tezpur does not have big shopping centres of shopping malls, but shopping in small markets of the town is altogether nice experience. Here you can buy traditional handicrafts and a variety of locally made items for your friends and loved ones. Tezpur is well connected by Air with Guwahati and Kolkata. Indian airlines and NRPC airlines operate direct flight from Kolkata thrice a week and every day from Gawahati. Taxis are available from the airport to the city centre. Tezpur has its own railway station, which is connected with Guwahati railway station. Guwahati is the nearest major railhead, which has several trains from all the important destinations of India. State and National Highways connect Tezpur with other cities of the state and the neighbouring states. State Government Buses and Tourist Buses ply regularly to and fro from Guwahati to Tezpur. Deluxe buses are available from Guwahati to Tezpur during the day time and night as well.